Weight: 3 - 3 3/4 pounds. Body Type: This breed originated in Belgium but has been developed in England. Body is well-rounded. 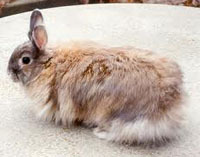 Fur on body is dense and of medium length fur two to three inches long froms a mane around rabbits with both lopped and upright ears are being developed at the time of this writing but only one or the other is likely to be accepted by professional breeders associations. Weight: 8 1/2 to 9 1/2 pounds. 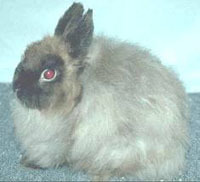 Body Type: These rabbits are white with ruby eyes. 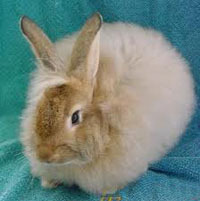 Compact and rounded with long wool on entire body, including tail, feet and upright ears. 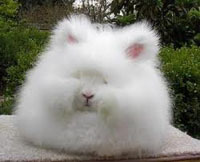 This rabbit has the most wool of any, because of a dense undercoat. Special Care: It requres extensive daily grooming and a special high-protein diet. Weight: 6 1/2 - 9 pounds. 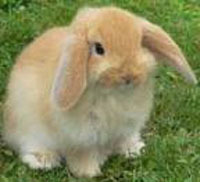 Body Type: This rabbit has long, fine, glossy-appearing wool covering all it's body but the head and the upright ears. Special Care: It requires extra grooming and a special diet. Weight: 2 3/4 to 3 1/2 pounds. Body Type: Body is rounded and compact. 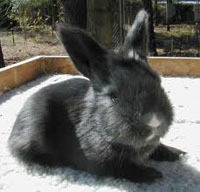 The Fur on the face and upright ears is short the rest of the body has long dense fur. They have been bred in many colors. 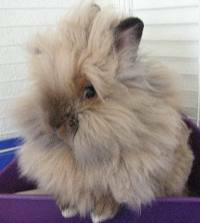 Special Care: These rabbits require extra time for grooming and special diet.